4 Bedroom Detached House For Sale in Oxfordshire for Offers in excess of £850,000. This attractive period stone detached cottage sits in a conservation area of this pretty North Oxfordshire village. The cottage is believed to date back to c.1860 and been extended and renovated by the current owners who have lovingly retained and enhanced many character features, including inglenook fire places, exposed stone walling and ceiling beams. Wood burning stoves have been installed in both the drawing room and the sitting room. 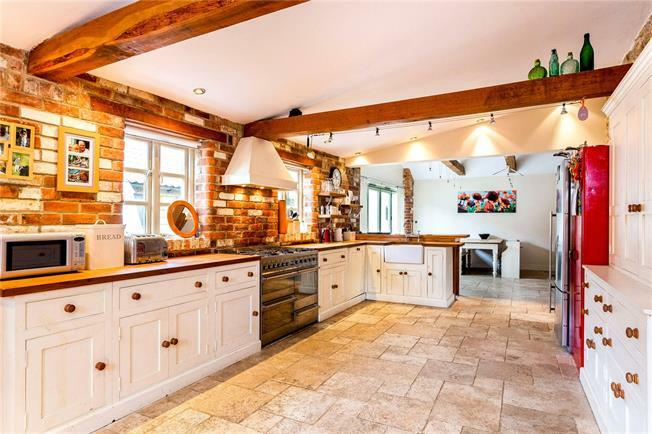 The kitchen has been extended and opened up to give a fantastic open plan living/dining space and fitted with hand painted units and contrasting oak work surfaces with exposed brickwork along one wall and the floor tiled with travertine. From the kitchen dining area there are trifold doors leading out to the terrace. On the ground floor there is also a front reception hall, study, utility room and cloakroom. On the first floor the master bedroom has an ensuite shower room, there are three further bedrooms and a family bathroom with beautiful roll top bath and decorative wall panelling. The property is set in approaching 0.3 acres and the main garden lies to the rear and left hand side of the cottage. It is mainly laid to lawn with an attractive enclosed terrace ideal for outside entertaining. There is a gravelled driveway accessed via double gates at the rear of the cottage leading to the outbuilding. Subject to obtaining all the relevant consents this detached outbuilding would make an excellent granny annexe. A further gravel driveway can be found at the front, on the right hand side. There is also a useful attached wood store.